Awoiska van der Molen ( b. 1972 in Groningen, the Netherlands) lives and works in Amsterdam. She has participated in numerous exhibitions at institutions including Pier24 Photography in San Francisco, Huis Marseille in Amsterdam, FoMu in Antwerp, Nederlands Fotomuseum in Rotterdam and Kyotographie in Kyoto. Her first major museum solo show was held at Foam Fotografiemuseum, Amsterdam in 2016. Her work is represented in public and museum collections such as the Victoria & Albert Museum in London, Stedelijk Museum in Amsterdam, Museum of Photography in Seoul and Fotomuseum The Hague. Awoiska van der Molen graduated with a MFA in Photography at the St. Joost Academy, Breda in the Netherlands. 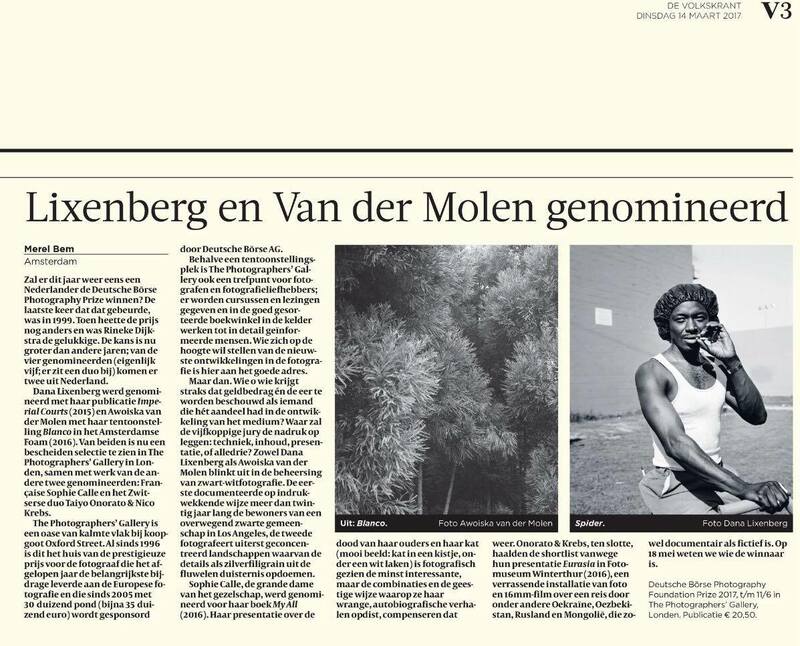 In 2017 van der Molen was shortlisted for the Deutsche Börse Photography Foundation Prize and she was the recipient of the Larry Sultan Photography Award 2017. She received the Japanese Hariban Award in 2014 and was finalist at the Hyères Festival International de Mode et de Photographie in France in 2011. Her monograph 'Sequester' has been nominated for the Paris Photo / Aperture First Book Prize in 2014. The practice of Awoiska van der Molen is informed by an intuitive approach to image making, and her interest in the intangible qualities of her subjects. Her early works include poised portraits of women on the streets of New York, families sitting quietly together, or other works where her sitters’ attention lies beyond the camera. She continues this approach in her photographs of urban environments, producing uncanny pictures of anonymous houses and streets. Since 2009, van der Molen has taken black and white, abstracted images in nature. Spending long periods of time in solitude in remote landscapes, she slowly uncovers the identity of the place, allowing it to impress upon her its specific emotional and physical qualities. Using her personal experience within the landscape for her creative process, she instinctively searches for a state of being in which the boundary between herself and her surroundings blur. The few images that travel back with her offer a visceral and elusive ambiguity. Their complexity resists a generative reading of place by framing its essential parts anew. Van der Molen often employs a nuanced tonal palette that displaces the perceptions of space, distance and time. Without titles or any indications of location, her large-scale silver gelatine prints recreate her personal experiences in the landscape for the viewer and remain open to interpretation. 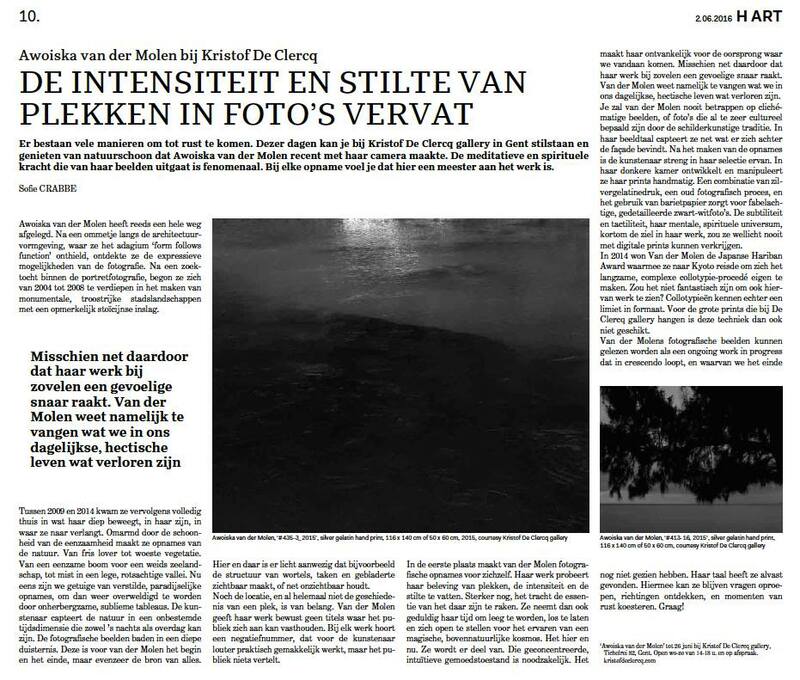 Van der Molen’s pictures are printed by hand in the dark room, continuing the intimate, laborious sequence of slow processes and creating a unique stillness that emanates from her work.
" ...The longing to return to a more essential state has been a reoccurring motif in my work. At first in my portraits and urban landscapes, both seemingly unspoilt by the fleeting outside world. And then, gradually, in the remote natural landscapes, which have been the focus of my work for the past eight years. To reach this 'state', I ‘peel’ away the superficial presence of the fleeting now, of man and even of land itself, until I sense I’ve reached the core. At times, I think of my work as the Monadnock — a geological rock, left behind after the soft material around it has been removed through a long process of erosion. Only the hardest stone, the core, remains." In 2014 Awoiska van der Molen was the first recipient of the Japanese Hariban Award and was invited to Kyoto. Here she collaborated with master craftsmen of the Benrido Collotype Atelier to produce collotype prints of eight of her works. The result was exhibited in a former samurai residence: Kousei-in. One set of 8 collotype prints has been acquired by the Victoria and Albert Museum in London. January 2016. Subtitles follow soon.